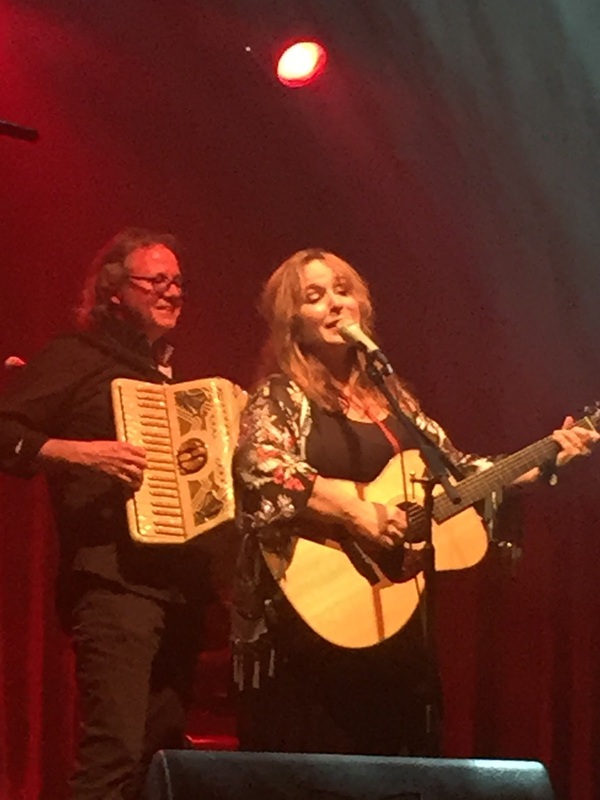 There is certainly nothing like an appearance at the Glastonbury Festival to give Gretchen Peters an extra kick in her step. Two years ago she was still on a high after playing the prestigious event when rounding off her UK tour in Bromsgrove a day later. In 2015 it was another Midlands venue that hosted Gretchen, albeit this time on the eve of her festival appearance. The Assembly at Leamington Spa, with its excellent sonic environment, has been acknowledged by Gretchen as a particular favourite on the UK circuit to the extent that it was the scene of the infamous back stage Couch by Couch West video on their last visit. 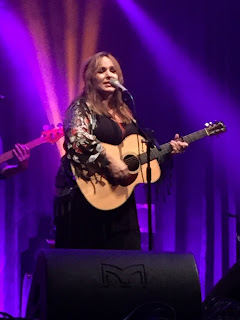 With the anticipation of the following day’s gig spurring the band and her on, Gretchen didn’t disappoint with an exemplary performance driven mainly by songs from her last two albums. With the effects of the recent highly successful Blackbirds UK tour barely worn off, Gretchen, Barry, Christine and Conor were once again reunited as a quartet to replicate the magic of the two previous albums into a live interpretation. 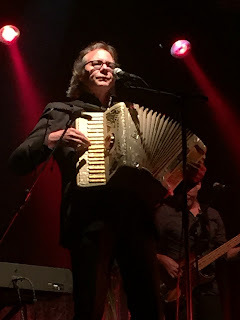 Understandably the songs from BLACKBIRDS took pride of place in the set list which spanned across an interval, on an evening dictated like so many weekend gigs by an early start. However this had no bearing on the ensuing quality that followed with the new songs getting bedded in more effectively as live numbers. They also have the added impetus of driving the older songs to higher limits and for nearly two hours tonight, Gretchen effortlessly moved into a raised sphere of performance revealing an artist still in the ascendancy some two decades since flirting with the bright lights of conditional fame. What we get from Gretchen in 2015 is acres of unconditional brilliance as she ferments as a writer and visibly moves audiences with her stage rendition of a back catalogue framed for posterity in the annals of the vinyl and digital world. The band experience has uplifted the immortality of songs from HELLO CRUEL WORLD to now reside alongside her 90s classics. No doubt in time, the same will apply to many of BLACKBIRD’s tracks as even in the space of four months since an inaugural live listening, they seemed to acquire an enhanced stage dimension. Of course this is natural progression for the output from an artist now enshrined in the Nashville Songwriter’s Hall of Fame. No mean feat given the fantastic heritage of lyrical composers thriving in the creative surroundings of Music City. For those who saw Gretchen on the recent tour, the set list this evening was almost identical to those successful shows with the John Prine and Rodney Crowell covers bringing the evening to an encore climax. There was the usual segment of Barry’s solo work with its stark film score appeal and the humble appreciation from Gretchen of being accepted in this almost second home of the UK. The energy and buzz from the stage was fizzing around song after song meaning that the bar was suitably raised from her last Midlands gig at the somewhat larger Birmingham Town Hall. The build-up to this show, and subsequent turnout, to what was effectively a solitary warm up gig for the big event, may have been lower key, but the warmth of the reception was no less forthcoming and a positive vibe infected all parties to a similar extent. So Gretchen headed off to a field in Somerset with a bucketful of confidence and inspiration, alongside a thinly disguised desire to meet the Dalai Lama. Meanwhile a delighted audience lapped up a highly charged show echoing with subtle emotion, masterly musicianship and songs steeped with utopian ideal. Gretchen Peters is on top of her game in both a recording and performing capacity. The evolution, development and fulfilment of this artist’s career continues to move boundaries and being an active witness equates to sheer marvel and enjoyment. Blackbirds (2015) - Blackbirds. Pretty Things. When All You Got is a Hammer. Everything Falls Away. The House on Auburn Street. Nashville. Black Ribbons. The Cure for the Pain.